Note from Goldenlight: Personally, I’ve switched to all organic plant-based foods, but it’s difficult to avoid all GMO foods. But I am trying to only eat certified organic which is HOPEFULLY non-GMO. My next step is to grow my own. 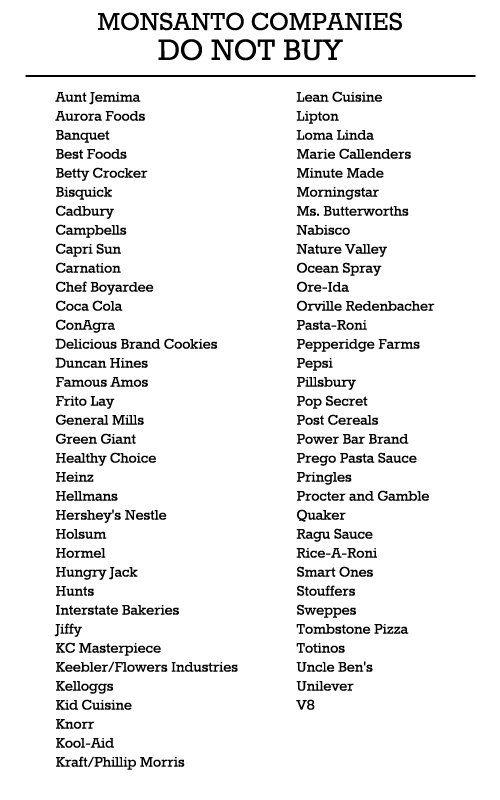 THE BRANDS BELOW SPENT MILLIONS/BILLIONS BLOCKING LEGISLATURE TO LABEL GMO FOOD BECAUSE THEY DO NOT PRODUCE OR SUPPORT NON-GMO FOOD. THE DANGERS OR GMO FOOD ARE HUGE. I WILL BE BOYCOTTING THE CORPORATIONS, THEIR SUBSIDIARIES AND THEIR BRANDS/PRODUCTS THAT FUND THE OPPOSITION OF PROP 37 AND MY RIGHT TO KNOW IF GMOS ARE IN THE FOOD I PURCHASE. Mars Botanical™ through CocoaVia™, a daily cocoa extract supplement designed to help maintain healthy circulation; Mars Veterinary™ through Wisdom Panel®, our patented DNA testing kit for canines; and, Mars Plantcare through Seramis®, an indoor plant clay granulate that provides a natural substrate in which to grow healthy plants. The Snack Food Association (SFA) is the international trade association of the snack food industry representing snack manufacturers and suppliers. Use Regularly and Share Often!